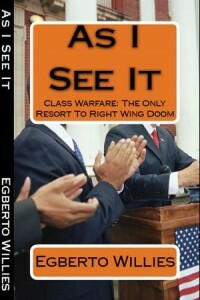 As I See It: Class Warfare The Only Resort To Right Wing Doom is an essential read. Going forward it is imperative that when we go into the voting booth that we are educated, voters. Today's politics affect your finances, your wealth, your job, and your income directly. This book ties it all together. America is currently at a tipping point. There is an ideological battle between the Left Progressive Liberals and the Right Wing Conservatives. This book illustrates the massive defects in the Right's policies that have led us to the brink of a precipitous fall over a cliff. The book provides the real narrative that should be the balance between the corporation, the government, and the individual citizen. It dispels the notion of the corporation being inherently more benevolent than the government. Most importantly the book presents a logical solution to the economic woes of the country. Implemented over time the suggested policy changes would ensure that America lives up to the America we all expect it to be. This book is an easy read. It will allow you to open yourself and questions all that you thought you knew about our economy.